Fans of Disneyland and Disney World exclusive Star Wars figures look to have another one to add to the list. 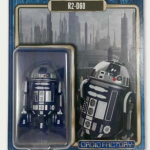 Vinylmation World has revealed that there will be a new Disneyland 60th Anniversary Star Wars R2-D60 3.75″ Droid Factory Figure. The figure, which looks to be available exclusively at Disneyland, will be limited to just 6,000 pieces. It will be priced at $12.95.